It’s not all that often that some news genuinely makes you jump out of your seat in excitement. 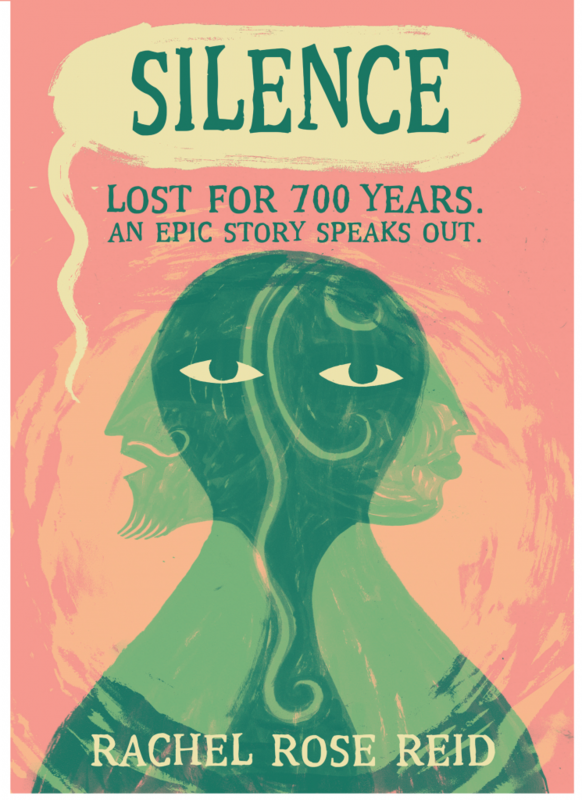 One such occasion came for me a couple of months ago, when my email inbox, usually reserved for reminders about overdue library books, served up a cracker: namely, that a storyteller, Rachel Rose Reid, was working on a retelling of the thirteenth-century French text, Le Roman de Silence, and was looking to connect with academics who could inform her work. For someone like me, who works with medieval French texts as part of his PhD, this opportunity was just too good to pass up. Funnily enough, though, the wave of excitement that the email inspired — and that saw quite possibly the fastest email reply I’ve ever written — was probably not too dissimilar to the eagerness felt at the moment when Rachel’s source text was first uncovered. 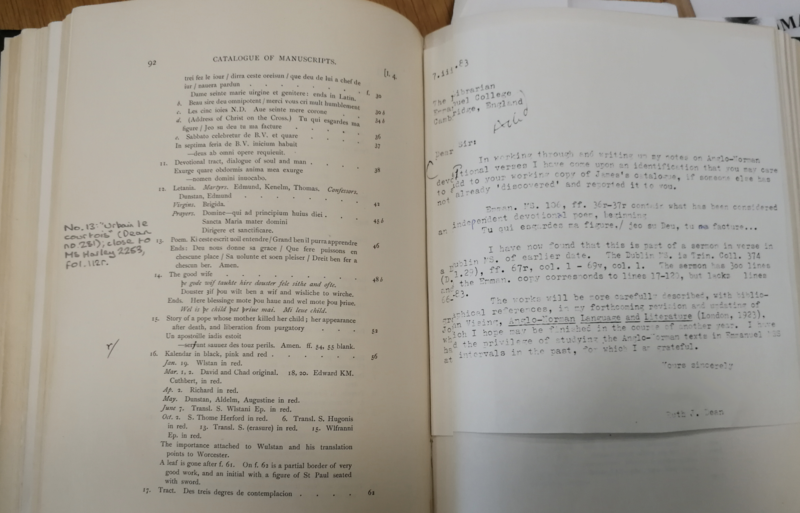 The story of behind the Roman de Silence is almost as famous as the Roman itself: it survives in just one manuscript, currently in the care of the University of Nottingham’s Special Collections, which was discovered as late as 1911 in a box marked ‘old papers — no value’. It’s with the narrative of the Roman de Silence, however, that Rachel really works her magic. After King Evan of England declares that no woman shall ever inherit in his kingdom, one of his vassals, Cador, agrees with his wife Eufemie that their newborn daughter, Silence, should be raised as a boy. There follows a debate between the allegorical figures of ‘Nature’, who unsuccessfully attempts to persuade Silence of the folly of their ways, and ‘Nurture’, whose intervention leads to Silence undertaking a range of traditionally masculine pursuits. These questions of gender and upbringing form some of the key themes of this 6,000-line piece, which Rachel has separated into a trilogy. 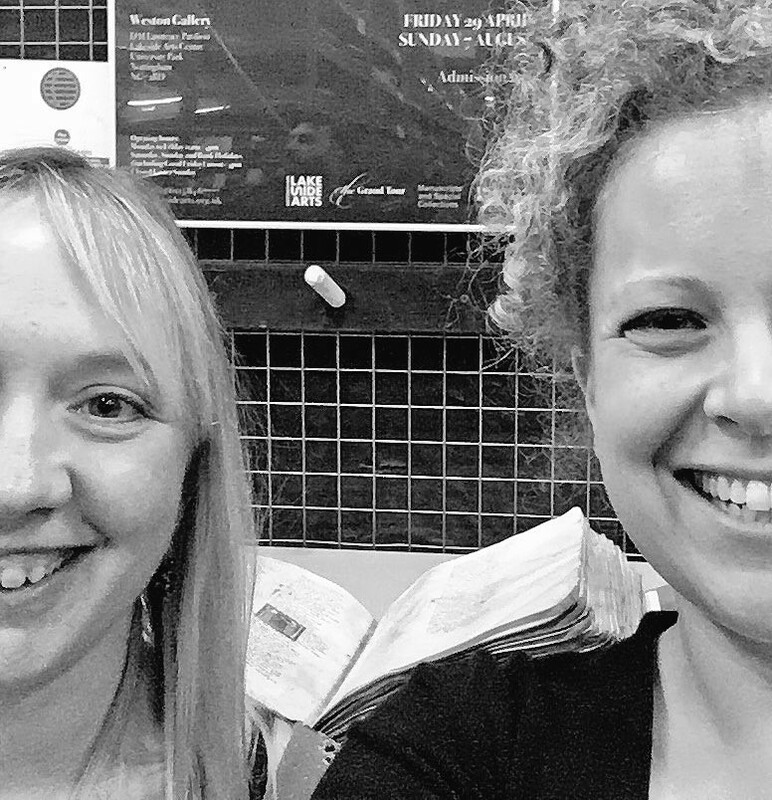 With all this in mind, I jumped at the chance to find out more; still buzzing from the free press ticket to a performance the night before, I sat down to talk to Rachel about how she went about adapting Silence, as well as her own experience with the work. So first things first … you’re known as a ‘storyteller’, and work with both children and adults. 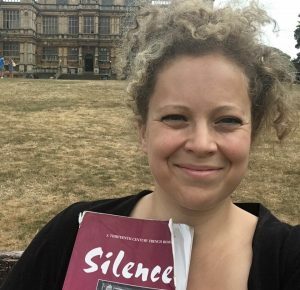 Many of the people reading this blog might not be all that familiar with what exactly it is that a modern-day ‘storyteller’ does; could you give us a brief introduction of what you try to achieve when you work with stories like Silence? The first thing to consider when talking about ‘storytelling’ as a vocation is really just how many ideas it encompasses. There are many different storytelling traditions around the world, and these all adhere to their source material to different degrees; I suppose that a Shakespeare performance would be at one end of this spectrum, where going to see (say) Hamlet several times, you’d expect to see a very similar performance on each occasion. In that case, then, there’s got to be something in the performers’ interpretation of the text that would bring it alive for you. At the other end of the scale, we have the folk traditions that are still alive in Ireland and Scotland, where the storyteller will know the ‘marks’ that they have to hit, but won’t be too concerned about sticking rigidly to a certain pace as they move through them. I work with both forms: in performance poetry, my words are the same every time, whereas in shorter storytelling – up to about 20 minutes – I have ‘markers’ and improvise between them. Silence, though, is an epic endeavour, and requires some combination of the two. I’m more certain of what I will be saying and doing, so that I can take the audience on a complex narrative and emotional journey, but my relationship with the audience in my performances is far more porous than you might otherwise expect from the image conjured up by the word ‘performer’. 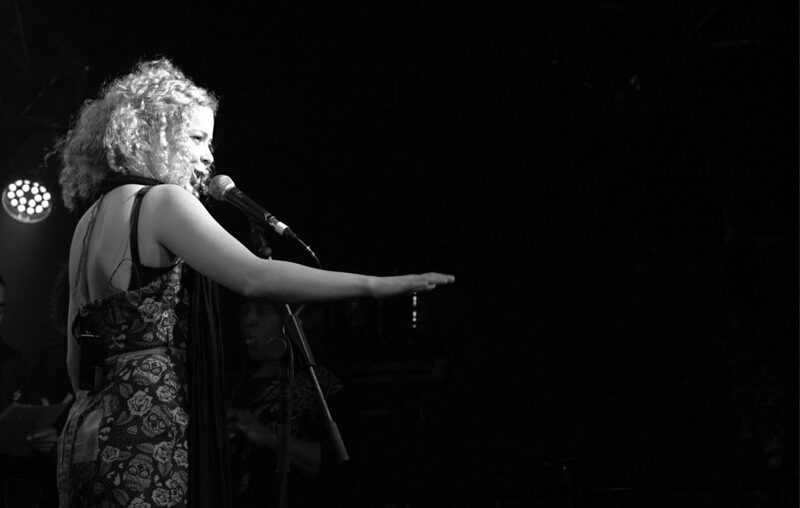 In a way, my work is a combination of the skills of stand-up comedy and guiding group meditative visualisation: even if Silence contains many of the same elements from night to night, every show is made different by the different audiences. I try to create a synergistic relationship between myself as the storyteller and the audience, where can I respond to things that we experience in the room while still remaining inside the ‘landscape’ of the story. Medievalists will know that the chivalric interactions between Cador and Eufemie in Silence are essentially a giant send-up of the Tristan and Isolde legend, but my audience — many of whom of course aren’t medievalists — won’t. That’s why I elaborate the minstrel scene when I tell Silence: so I can set up a repeated idea of what a ‘romantic story’ is, before the audience get to see me taking the mickey out of it! What’s more, these stories are the kind of ‘romantic story’ that we’re flooded with in popular culture today — what about rom-coms, where we essentially repeat the same narrative over and over again? There’s often a contradiction in how people see the medieval period: somehow, popular culture imagines it both as a ‘purer time’ characterised by chivalry and knights in shining armour, and yet also as an epoch of abject misery and filth. What were your experiences of working with this particular period of history? What is key to me, in bringing this story alive, is for my 21st-century audience to find the many connections that exist between our own experiences, those of Heldris, and those of the characters. We’re not doing faux medieval re-enactment here: I don’t want the audience to be scratching their heads over obscure terminology, or despairing over sections that seem over-egged to the modern ear. However, I’ve found that the plot points at the heart of Silence only need minor alterations for them to be understood today. Heldris has so much to say about topics that are both thrilling and troublingly familiar for us to hear today: equality, identity, religious dogma, sexual abuse, the damage done by an overbearing patriarchal structure … The legal matter of land and title is still going strong, too, both in our unspoken social norms and in the aristocratic echelons around which Heldris centres the story. Sometimes I think that the reason the text went missing for a few hundred years was simply that it was exhausted … In this text, I’ve been delighted to discover that this medieval writer-storyteller uses so many of the techniques that my peers and I use: satire, flippancy, sarcasm, self-deprecation, timing, and alternating between colloquial chat and grand dramatic imagery. I’m not planning to perform in rhyming couplets, but in working on this project, I have found great joy in discovering the world of medievalists, too. I’m looking forward to sharing this adventure with more medievalists, and I hope that by 2019 we will have several places where the entire story can be told. As you can tell, Rachel and I certainly had a lot to talk about — so much, in fact, that we’ve decided to split this interview over two blog posts! In the second part of our interview, we’ll be talking a little more about some of the more specific challenges posed by retelling Silence, specifically how Rachel responds to the challenging topics addressed by the text. 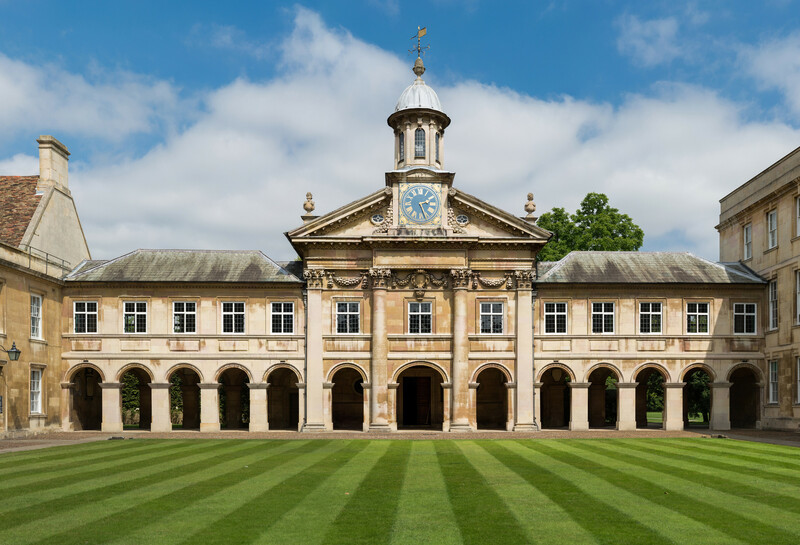 As an undergraduate, I spent quite a lot of time in and around Emmanuel College, Cambridge. One of my best friends was a student there, and in the spirit of putting inter-collegiate rivalries aside, we visited each other fairly frequently. A not-insignificant portion of my undergraduate dissertation was written, as was his, in the throes of ‘writing sprints’ in his room, fuelled by gallons of tea and the constant reminder that the College canteen did excellent desserts. One place I barely set foot in, though, was the College library; as a member of another College, I wasn’t really supposed to be there anyway, and even the most cursory of tours felt somewhat transgressive. It was something of a surprise, then, when I realised that I’d need to go back to ‘Emma’ in the course of my PhD research. At the moment, I’m investigating the tradition of so-called ‘courtesy books’ produced in Anglo-Norman, and specifically the text known as Urbain le courtois. Urbain survives in 11 manuscripts, ranging from the sumptuous and meticulously-produced to the altogether-less-impressive (such as MS Douce 210), but only nine of them have been edited. By the standards of many medieval texts, such comprehensive coverage would warrant a pat on the back and a sense of pride at a job well done, but in the case of Urbain, the fact that two manuscripts remain excluded from discussion becomes something of a problem. These two additional manuscripts – one of which, as you will probably have guessed by now, is at Emmanuel College – remind us that medieval manuscripts can often be characterised by what Bernard Cerquiglini has termed variance. Urbain is effectively a compilation of fairly pithy advice on how to behave at court – kneel before your superiors, don’t drink to excess, and so on – but the order in which an individual scribe presents his material, as well as the decisions that are made regarding what to include and what to leave out, can tell us a great deal about how the didactic process was imagined in Anglo-Norman texts. The two manuscripts that remain unedited could, I thought, offer valuable clues for unpicking the relationships between the various witnesses to the text of Urbain, and with this in mind, I realised that investigating the manuscript held by Emmanuel College in person would be an essential step in looking to understand the textual history of this peculiar piece. For any manuscript to have survived to the present day is a remarkable achievement, and one that can be largely put down to the tireless work of the many Special Collections departments up and down the country. As custodians of works that are hundreds of years old, manuscript libraries are well within their rights to set their own rules about who can access their collections, and what you’re allowed to do with them during your visit. The rules at Emma are fairly standard for smaller libraries: no liquids or pens were to be brought into the room, and I was to be supervised by a member of staff at all times while consulting the manuscript. I was also asked to provide a letter of introduction, signed by my supervisor (and, in a charming throwback to an age before email, printed on University-headed paper). The only surprise came when I was told photography would not be permitted, a policy which many larger collections are increasingly relaxing in the age of ubiquitous smartphone cameras. Before consulting any manuscript, it’s a good idea to look up its entry in the catalogue to get a sense of its layout and contents. Many medieval manuscripts, in spite of containing multiple texts, didn’t come equipped with contents pages in the way that we might expect today, and so the catalogue, whether it’s a fully searchable web database, a dusty print volume, or somewhere in between, plays a vital role in telling you where to look for the item that you’re after. In my case, the catalogue as I consulted it was an intriguing mix of the old-school and the modern, taking the form of a digital scan of the 1903 paper ‘handlist’, freely available through the wonderful Internet Archive. There are, of course, many things that a catalogue, print or otherwise, cannot help you to expect, and one of these was the remarkable dimensions of the manuscript. My eyes having somehow managed to skip over the small note on the size of the manuscript, I walked into Emma’s Special Collections reading room expecting to meet a book of similar dimensions to MS Douce 210: approximately A4 size, or possibly slightly smaller. What I didn’t expect was to be handed a book that could sit comfortably in one hand, measuring just 11cm by 7cm, into which the scribe had somehow managed to cram up to 200 words on each individual page. 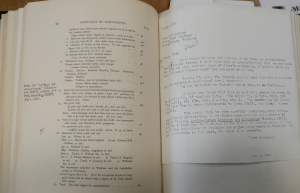 This was my first time investigating a manuscript without having the luxury of a photo to fall back on later, and I have to confess that this constraint led me to interact with the manuscript in a surprisingly different way. My main task was the same as it often is when consulting manuscript versions of texts – transcribe its contents for comparison with other manuscript witnesses – but this time, I found myself transcribing in a much more conservative manner. Abbreviations were left unexpanded: for now, the question of whether qe .referred to q[e] or to q[ue] would have to wait, as I sought to record as much information as possible, as accurately as possible. In short, I realised, I was trying to create a photograph without actually taking my phone out of my pocket. This kind of ‘slow photography’, however, was in its way more useful, and more engaging, than any 5000 x 3000-pixel JPEG ever could be: correction and every decoration, I was engaging with the manuscript in a much closer fashion, treating it as far more than just a repository of folia containing potential image data. It took me approximately 90 minutes to fully transcribe two and a half folios out of the approximately 200 that make up the manuscript, and in that time I found myself realising just how intricate, and how time-consuming, the medieval scribal process could have been. There was, however, one more task for me to complete before MS 106 was returned to its box. One curiosity of Emma’s library is its own copy of the catalogue: readers consulting Special Collections are invited to leave their mark on this unique copy, which is printed with blank leaves in between each standard page in order to allow space for readers to add notes. These usually take the form of publication announcements, with pencilled-in additions indicating that (say) item no. 36 from a given manuscript has recently been published in the 2009 edition of a major medieval studies journal. Occasionally, however, a more personal story would emerge, and as I added my own note to the catalogue, one of these presented itself to me. While I was clarifying the contents of item no. 13 in MS 106, I came across a letter on the opposite page from a certain Ruth J. Dean, informing the Librarian that she has discovered details of the context to one of the pieces in this very same manuscript. More information would be available, she noted, ‘in my forthcoming revision and updating of John Vising’s Anglo-Norman Lannguage and Literature, which I hope may be finished in the course of another year.” If the letter can be dated, as the top-left indicates, to 1983, then Ruth Dean’s optimism about the speed with which her work could be finished was somewhat misplaced, with Anglo-Norman Literature: A Guide to Texts and Manuscripts not being published until 1999. Nevertheless, it was a great pleasure for me, as someone who uses Dean’s life-work on an almost daily basis, to add my own reference to Emmanuel’s catalogue using a numbering system that she herself devised. Thanks to Dr. H. C. Carron at the Library of Emmanuel College, Cambridge for allowing me to consult MS 106, and to all of the Library staff for their warm welcome and willingness to answer my innumerable questions.